Illegal immigration and illegal crossings are now numerically worse than ever under President Trump because of his failures to secure America's borders and fully enforce existing immigration laws as he promised during his 2015-2016 campaign speeches. In fact, Trump's endorsement of GOP leadership-backed Amnesty bills in Congress (Goodlatte Bill, HR 4760) and admission of earlier caravan members into the US has encouraged, inspired, and facilitated this new historic level of invasion. 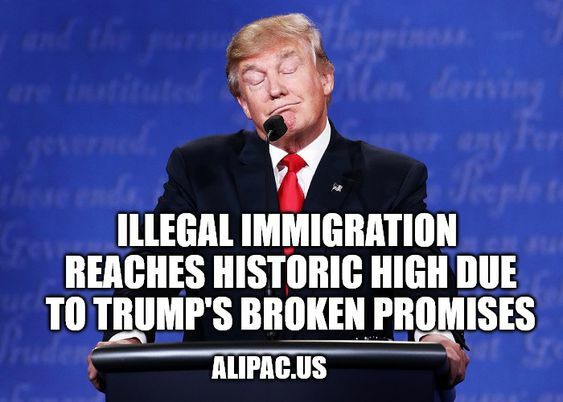 ALIPAC believes the new multiple large caravans of illegals are inspired by Trump's broken campaign promises on immigration and his decision to allow the first caravan into America earlier in 2018. ALIPAC also contends these are the issues which demoralized GOP base voters in the 2018 midterms leading to 16 pro-Amnesty Republicans losing their seats in Congress to Democrats. "We want all Americans and lawmakers to know and understand that these new larger illegal immigrant caravans are inspired by President Trump's very unwise decision to allow the first caravan in after he feigned he would have DHS repel that first caravan, and his focus on passing Amnesty for illegals instead of sending them home as he promised voters in 2016," said William Gheen, President of ALIPAC. "The illegal aliens and drug smugglers no longer believe Trump's campaign rhetoric, and neither do we. That is why illegal crossings have now risen to new historically high levels under Trump's watch. It is time for all Americans to come to terms with these broken promises and dirty tricks so we can begin to mount a new national defense that does not rely on Trump keeping his word or adhering to his oath of office any better than Bush or Obama." President Trump recently argued with CNN's Jim Acosta that he believed the caravans and illegal immigration are an invasion. Therefore, President Trump is now violating his oath of office by refusing to enforce Article IV of the US Constitution which gives him war powers and a responsibility to "protect all states from invasion." ALIPAC has argued that US Presidents should invoke Article IV of the US Constitution to stop and reverse illegal immigration and send millions of illegals home as America did in the 1920s and the 1950s, as this is the only thing that has historically stopped or slowed the flow of illegal immigration. ALIPAC also recommends that US lawmakers, pundits, activists, groups, and media begin taking steps to emulate the nation of Hungary's response to George Soros backed immigrant invasions designed to swamp nations in the European Union and America. In Hungary, Austria, and Russia, they have passed laws to prevent George Soros and the army of organizations he finances from supporting illegal immigration into their nations. Here in America, many organizations such as the ADL, SPLC, and People for the American Way (PFAW), and hundreds of La Raza (The Race) groups are being funded by Soros for their efforts to keep America's borders open to illegals no matter how many Americans lose their jobs, communities, tax resources, elections, or lives. ALIPAC contends that thousands of Americans are being killed by illegal aliens each year, like Kate Steinle and Mollie Tibbets, because of the impact and influence of George Soros and the hundreds of millions of dollars he is spending to help flood nations with illegal aliens. ALIPAC recently accurately predicted a lame duck session amnesty push (View) and is now gearing up to fight the Koch Brothers backed lame duck illegal immigrant Amnesty legislation push in DC where GOP lawmakers will once again try to put Democrats in power forevermore in America by passing Amnesty for illegals before Christmas of 2018. Last edited by ALIPAC; 11-14-2018 at 02:39 PM. Beezer, southBronx and stoptheinvaders like this. If anyone has any questions or challenges to what we've said in this release, please post them here as I stand by every word of it. Beezer, MW and stoptheinvaders like this. DAPA are still here, they have not been deported! DACA still here, they have not been deported! UAC's are still here...they have not been processed and returned into the care and custody of their President. Liberal Judges let illegal alien criminals out and commit crimes against American citizens. Employers hire illegal aliens and are NOT serving time in jail for it. Governor's of the State are permitted to harbor, aid and abet illegal aliens awarding them Driver's Licenses, registering them to vote, giving them free medical care, welfare, food stamps, in-state tuition! The freebies have not been cut off. Mexico has not paid for the wall. Congress has done nothing to stop this! 50,000 a month pour over our border! We are still flying in refugees and asylum liars from all over the world and put the costs and burden on the American people. What happened to put them in "Safe Zone" on their soil? Never happened! TPS is still here. They have been here for over 20 years! Trump administration keeps extending the removal date! Why is the Church continuing to get ONE BILLION of our taxpayer money each year to facilitate their human trafficking! Public Charge law not being enforced. Medical exams not being enforced. They are bringing infectious diseases and health issues the American people are forced to pay for. Birthright citizenship has not been ended! Our healthcare has NOT been fixed. Our infrastructure is NOT being built. Our Social Security and Medicare is robbed and never paid back! THERE IS NO LAW...THERE IS NO ORDER...THE AMERICAN PEOPLE HAVE BEEN USED, ABUSED AND THROWN UNDER THE BUS! You complain the rest of the world is NOT paying their fair share in NATO. WE are footing the bill. Why are WE footing the bill to NATO to defend other countries and NATO does not defend ours? DEMAND THAT NATO TROOPS...WHO WE PAY FOR...WHO WE HAVE A RIGHT TO USE...GET THEIR REAR ENDS DOWN TO EL SALVADOR, GUATEMALA, HONDURAS AND ROUND UP EVERY GANG AND CARTEL MEMBER AND PUT THEM IN PRISON! "FEAR" AND VIOLENCE GONE TO COME HERE...SEND THESE ILLEGAL ALIENS BACK! WE PAY FOR IT, WE EARNED THE SERVICE AND WE DEMAND IT NOW! It is time for all Americans to come to terms with these broken promises and dirty tricks so we can begin to mount a new national defense that does not rely on Trump keeping his word or adhering to his oath of office any better than Bush or Obama." Getting rid of the requirement to let kids out of immigration custody quickly will take more than a stroke of the pen. The solution to the crisis of family separation at the US-Mexico border, the Trump administration has decided, is to get rid of a 1997 federal court decision that strictly limits the government’s ability to keep children in immigration detention. The Flores settlement requires the federal government to do two things: to place children with a close relative or family friend “without unnecessary delay,” rather than keeping them in custody; and to keep immigrant children who are in custody in the “least restrictive conditions” possible. Republicans in Congress have proposed legislation that would overrule Flores and allow children to be kept with their parents in Immigration and Customs Enforcement (ICE) custody while they are put through criminal prosecution and deportation proceedings — which many migrant families fight by claiming asylum in the US, a process that can stretch out for months or years. Trump can’t overrule the Flores settlement with the stroke of a pen. But getting rid of the court agreement has been in his administration’s sights for months. While Republicans frame Flores as the obstacle to keeping families together, many of the people outraged over family separation might not be too happy with a world without Flores, either. The Flores settlement now at the center of the family separation crisis has a 30-year history. In the 1980s, several lawsuits were filed over the treatment of unaccompanied minors who were in the care of the US government. One was filed by the American Civil Liberties Union in 1985 on behalf of Jenny Lisette Flores, a 15-year-old from El Salvador. She had fled her home country to find an aunt who was living in the United States, but she was detained by federal authorities at the US border. Flores and other minors in federal custody sometimes had to share sleeping quarters and bathrooms with unrelated adult men and women. Flores was strip-searched regularly, and she was told she could only be released to her parents, not her aunt. The ACLU asserted in its lawsuit that Flores and other unaccompanied children had a constitutional right to be released to “responsible” adults, as the Marquette Law Review documented in a review of the Flores settlement’s history. The case went through several federal courts before reaching the Supreme Court in 1993, and the high court mostly sided with the government. But the real consequence was a consent decree agreed to by the Clinton administration and the plaintiffs in the litigation in 1997. The decree, known as the Flores settlement, set standards for unaccompanied minors who were in the custody of federal authorities. JThe agreement required that children be released as soon as possible to either their parents, a legal guardian, another relative, or a vetted entity willing to take legal custody of the child. According to a summary from the Congressional Research Service, the order also required those minors who would be kept in federal custody be placed in the least restrictive conditions possible and be provided with some basic necessities, like food and water, access to medical treatment, access to running water, and that they be separated from adults to whom they had no relation. But over the years, immigration authorities were not fully complying with the Flores settlement. Congress passed laws in the 2000s that would eventually require the Department of Homeland Security put unaccompanied children in the care of the Office of Refugee Resettlement, within the Health and Human Services Department. Over the past couple of decades, the principles undergirding Flores evolved into specific rules about exactly how long and under what conditions children can be held. But they generally applied only to children who had entered the US as unaccompanied minors — not those who arrived with their parents. In 2014, however, the Obama administration attempted to tamp down the number of Central American families seeking asylum in the US by keeping families in detention and processing and deporting them as quickly as possible. Ultimately, the Ninth Circuit ruled that the Flores settlement covered not just unaccompanied alien children but “accompanied” ones as well. It set a general standard that the government couldn’t hold them in custody for more than 20 days. The Ninth Circuit stopped short of saying that parents could be released under Flores. But the federal government hasn’t responded to Flores by keeping families together for a few weeks and then splitting them apart. Instead, it’s made a practice, for the most part, of releasing the whole family after 20 days. Since the current family detention facilities — two in Texas created under Obama, and an older one on Pennsylvania — are mostly full, they don’t have a ton of space to detain families anyway. To the administration, the extra legal protections against indefinite detention of asylum seekers, and much stricter protections under the Flores settlement against indefinite detention of children and families, are nothing but legal “loopholes.” It would prefer to be able to detain all immigrants who enter the US without papers until their cases are resolved (and, preferably, resolve those cases as quickly as possible with deportation orders). Keeping families together in immigration detention really would suit the government’s interests. It’s more expensive to keep parents in detention while children are under HHS care (or placed with sponsors or fosters) than to keep both in one detention facility. And legally, the government would be allowed to treat the family as only one case, with one shot to enter the US, rather than as two separate cases as parent and child. In theory, Flores could be superseded at any time by DHS regulations — it wasn’t supposed to be a de facto law, just a framework to keep in place while the government came up with permanent rules to ensure migrant kids were adequately protected. (Of course, what counted as “adequately” would be up to the court.) Or Congress could pass a bill that made it clear that children are allowed to be kept in Immigration and Customs Enforcement facilities just like adults are, wiping away the Flores settlement. At first, Trump’s DHS was reportedly considering trying to go the regulatory route. The proposal also attempts to address a restriction on how long migrant children and their parents can be held at the family residential facilities. Judges have ruled that their stays must be limited to 20 days or less, in part because the centers are not state-licensed. The proposed regulations would allow federal licensing of such facilities, which could open the door for longer stays. The draft says the administration currently holds families for an average of 14 days and is examining cost estimates that would expand that to an average of 45 days. But issuing regulations is a months-long process, and President Trump doesn’t have time for these things. Instead, he plunged ahead with the “zero tolerance” prosecution policy, making the separation of families a widespread occurrence — and prompting a groundswell of opposition that appears to be getting stronger by the day. It’s not at all clear that Trump can, legally, issue an executive order that would override the Flores settlement. That’s why analysts are assuming that any order Trump issues to keep families together in DHS custody will be challenged by a lawsuit and may get thwarted. If DHS somehow manages to craft an executive order that evades that issue, or if Congress passes any of the suite of Republican bills that purport to end family separation by expanding family detention, it will mean one of two things. Either the Trump administration will start keeping families in detention for as long as it takes to fully adjudicate their asylum cases — which can take months or years — or it will need to ram them through an “expedited” legal process to minimize their time in detention. President Obama tried the latter in 2014. It went horrifically. Pro bono lawyers who went to family detention facilities (which were flung together in a matter of weeks) reported that it was all but impossible for families to get due process for their asylum claims. The former is what families are still going through at the Pennsylvania facility. The long-term detention of immigrant children raises some of the same concerns that keeping them in custody without their parents does, in terms of long-term trauma. Bright lights in the Burks facility reportedly keep children from sleeping well, for example — and they can be disciplined if they try to climb into a parent’s bed for comfort. Furthermore, getting rid of the Flores settlement entirely wouldn’t just get rid of the mandate to release children; it would also get rid of the requirements for what conditions children must be held in. In other words, the legal standards that undergird the Office of Refugee Resettlement facilities — standards that Trump administration officials brag are among the highest in the world — would be wiped away. Depending on what replaced Flores, it’s possible that ICE could simply use existing adult detention facilities to herd children into as well. The Trump administration could hold itself to higher standards. But for that matter, it could also find an alternative to detaining immigrant families that still allowed the government to ensure they showed up in court. It does not appear inclined to do so. Last edited by Judy; 11-15-2018 at 04:26 AM. As a candidate, Donald Trump promised to get rid of the entire national debt “over a period of eight years. On 20 January 2017, the date of the president's inauguration, the total outstanding public debt was $19.9----now it is 21.7 trillion. This one doesn't exactly fall under the immigration umbrella, but the National Debt will be much greater with all these extra mouths to feed, cloth, medical bills, attorneys, translators, travel expenses, jail expenses. Beezer and ALIPAC like this. Promises Made, Promises Broken: you are fired! ALIPAC Web Traffic & participation At Historic Highs!